The free Plane firmware running on a compatible controller board gives any fixed-wing aircraft full autonomous capability. VTOL fixed-wing aircraft that hover and cruise in different configurations are also included under the arduplane firmware. Plane provides advanced functions such as support for hundreds of three-dimensional waypoints, automatic take-off and landing as well as sophisticated mission planning and camera controls. It works with a variety of Ground Control Station (GCS) software for programming and mission operations and offers a complete UAV solution. The entire package is designed to be easily approachable for the novice, while remaining open-ended for custom applications, education, and research use. This is the platform that won the prestigious Outback Challenge UAV competition in 2012, 2014 and 2016 as well as the 2014 Sparkfun Autonomous Vehicle Competition. Ground Control Station with software that gives you an easy point-and-click setup/configuration, along with a full-featured interface. A suitable airframe, transmitter, and receiver for your mission. Support tools and hardware for operating and maintaining your aircraft. Many other useful options, such as two-way telemetry radios which allow in-flight communication and control between the aircraft and your computer. A fixed-wing aircraft has both advantages and disadvantages in comparison with rotor-craft. Fixed-wing aircraft tend to be more forgiving in the air in the face of both piloting and technical errors, as they have natural gliding capabilities with no power. Fixed-wing aircraft also are able to carry greater payloads for longer distances on less power. There is a huge variety of fixed wing aircraft from electric battery powered small foam planes to large scale wooden replicas with multi liquid fuel engines and everything in between. You are bound to find a plane that suits your flying style and needs. With the advance of VTOL fixed-wing aircraft, taking off and landing in tight spaces is now possible too. When precision missions are required, fixed-wing aircraft are at a disadvantage, as they must have air moving over their wings to generate lift. This means they must stay in forward motion, which means they can’t hover in one spot the way a copter can and as a result cannot provide the same level of precise camera positioning. For longer missions and more payload, a fixed-wing is your best choice. But for keeping a camera in one place or moving slowly, consider switching to a copter instead. 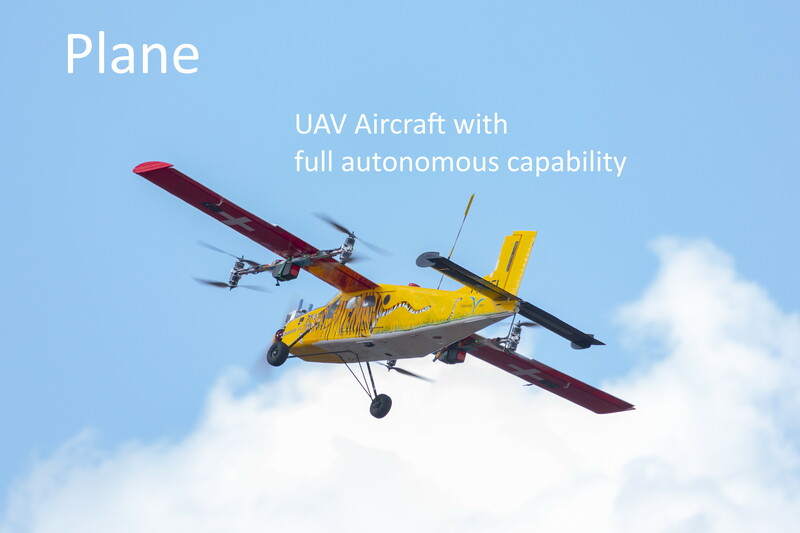 The same APM autopilot can control that equally well by simply loading the Copter code. Monitor https://discuss.ardupilot.org/c/arduplane for plane-related announcements.